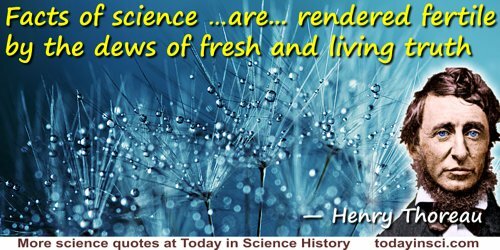 American writer, naturalist, philosopher and poet who is best known for his study of nature, while retired to live in a hut beside Walden Pond at Concord (4 Jul 1845-6 Sep 1847). Thereafter, he wrote two books: A Week on the Concord and Merrimack Rivers (1849) and Walden, or Life in the Woods (1854). Fishing has been styled “a contemplative man’s recreation,” … and science is only a more contemplative man’s recreation. In A Week on the Concord and Merrimack Rivers (1862), 28. He has something demoniacal in him, who can discern a law, or couple two facts. In 'Natural History of Massachusetts', The Dial: A Magazine for Literature, Philosophy, and Religion (Jul 1842), 3, No. 1, 39-40. In 'Natural history of Massachusetts', The Dial: A Magazine for Literature, Philosophy, and Religion (Jul 1842), 3, No. 1, 39-40. He is not a true man of science who does not bring some sympathy to his studies, and expect to learn something by behavior as well as by application. It is childish to rest in the discovery of mere coincidences, or of partial and extraneous laws. It appears to be law that you cannot have a deep sympathy with both man and nature. Journal entry (11 Apr 1852). 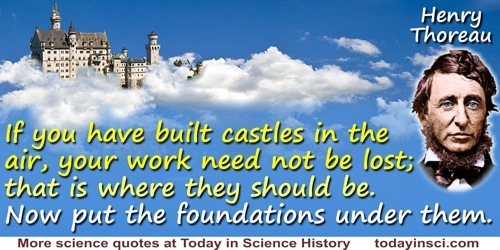 Much is said about the progress of science in these centuries. I should say that the useful results of science had accumulated, but that there had been no accumulation of knowledge, strictly speaking, for posterity; for knowledge is to be acquired only by corresponding experience. How can be know what we are told merely? Each man can interpret another’s experience only by his own. In Journal, (5 Jan 1856). In Henry David Thoreau and Odell Shepard (ed. ), The Heart of Thoreau’s Journals (1927), 227. 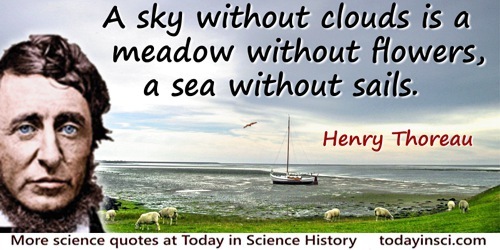 Our science, so called, is always more barren and mixed with error than our sympathies. In Early Spring in Massachusetts: From the Journal of Henry Thoreau (1881), 26. The most distinct and beautiful statement of any truth [in science] must take at last the mathematical form. A Week on the Concord and Merrimack Rivers (1862), 381. In 'Conclusion', Walden (1892), Vol. 2, 493. The works of the great poets have only been read for most part as the multitude read the stars, at most, astrologically, not astronomically. In James Wood, Dictionary of Quotations from Ancient and Modern, English and Foreign Sources (1893), 464:3. In 'Paradise (to be) Regained', The Democratic Review (Nov 1843), 461. There is more religion in men’s science than there is science in their religion. In A Week on the Concord and Merrimack Rivers (1862), 82. In A Week on the Concord and Merrimack Rivers (1862), 382-383. (16 Jul 1851). 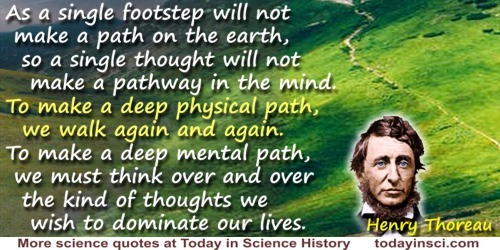 In Henry David Thoreau and Bradford Torrey (ed. 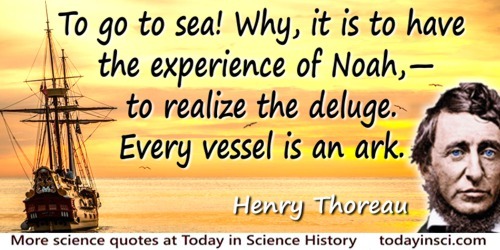 ), The Writings of Henry Thoreau: Journal: II: 1850-September 15, 1851 (1906), 307. 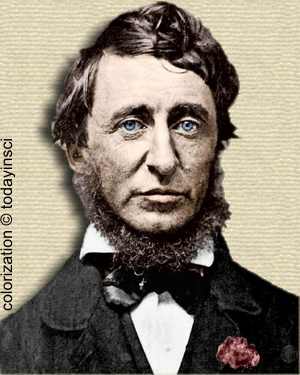 12 Jul - short biography, births, deaths and events on date of Thoreau's birth.